Azure Logic Apps supports basic JSON transformations through native data operation actions such as Compose or Parse JSON. 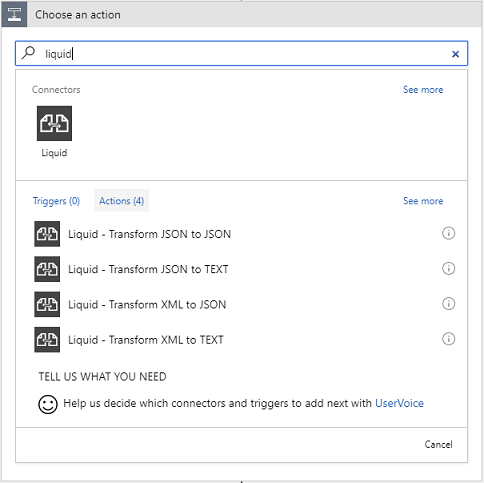 For advanced JSON transformations, we can use Liquid templates with our logic apps. Microsoft has released the support of Liquid Templates to transform JSON and XML objects. Liquid is a templating engine that uses a simple markup language to produce all sorts of output formats, such as HTML, JSON, CSV, etc. More details we can find here. It’s quite easy to use, we just need to get used to the new syntax. Within Logic Apps, Liquid templates are used as a kind of XSLT for JSON objects. This allows us to create more complex transformations on JSON objects, without the need of introducing a custom Azure Function. Liquid templates are part of the Integration Account. Behind the scenes, DotLiquid is used. Here we will see how to use a Liquid map or template, which supports more complex JSON transformations, such as iterations, control flows, variables, and so on. Save above liquid template as "JsonToJsonTemplate.liquid"
Open Azure portal and sing in with your existing account, if you don't have any account on Azure portal, first sing up and then log in to Azure portal. You should have your integration account created. In the search box, find and select your integration account like above screen shot. Once you clicked integration account, you could see some components in the right panel and here you have to click Map. Map type: The type for your map. For JSON to JSON transformation, you must select liquid. Map: An existing Liquid template or map file to use for transformation, which is "JsonToJsonTemplate.liquid" in this example. To find this file, you can use the file picker. Now here we have to create a logic app which will use in JSON transformation. Create a logic app, Add the Request trigger to your logic app. In the search box, type liquid, and select 'Liquid - Transform JSON to JSON'. In the Content box, select Body from dynamic content list or parameters list, whichever appears. From the Map list, select your Liquid template, which is "SimpleJsonToJsonTemplate_New" in this example. Go to your logic app menu, select Workflow settings from Settings section. Choose your Integration account name from the Select an Integration account list, and click Save. If you still are not able to see your integration account in a list then please make sure your logic app and Integration account should be in the same location. It’s time to test your logic app liquid JSON to JSON transformation. Use Postman or a similar tool to post JSON input to your logic app. In this example using postman tool. In this article, we reviewed how to create a user profile in Logic Apps using Liquid templates. Hope you’ve found this post handy. Feel free to add your comments or ask any questions below. If there's anything specifically that you want to be covered with respect to Liquid transform or Logic Apps please let us know. Another important place to find a huge amount of Azure-related articles is the TechNet Wiki itself.